Moving forward | Blooming Joy! I spent Monday in an all-day personal retreat, and it was great. I started out at this restaurant/coffee house/bar (?) recommended by a Facebook friend. Great coffee and the perfect place to get started going through all of my learning over the past four months. Basically, I pulled out all of my notes and conference materials and started going through and pulling out the useful tidbits. I have learned that I need to be doing something in order to pay attention or focus, so I take tons of notes when I’m in meetings and learning environments. Most of the time I find the notes are just bits of information that are useless. But there are always pieces that I can glean. After a while of copying the best parts of my notes from three different conferences onto new sheets of paper, I realized that I needed to spread out. We had hotel points (kind of like frequent flier miles) that I had reserved a room with (yay for freebies!). I called the hotel and they said I could check in early. So by noon I was in a room, spreading out my stuff across the desk and floor, and having lunch. I took a few short breaks during the day, and by nine o’clock that night, I had gone through everything. All of my notes were condensed down to a few pages. I had copied the information I wanted to remember about the women in my collegial group into a more organized way in a prayer journal. I had emailed everyone who had committed to being on my sounding board with the specific assignments I had for them to help me with. 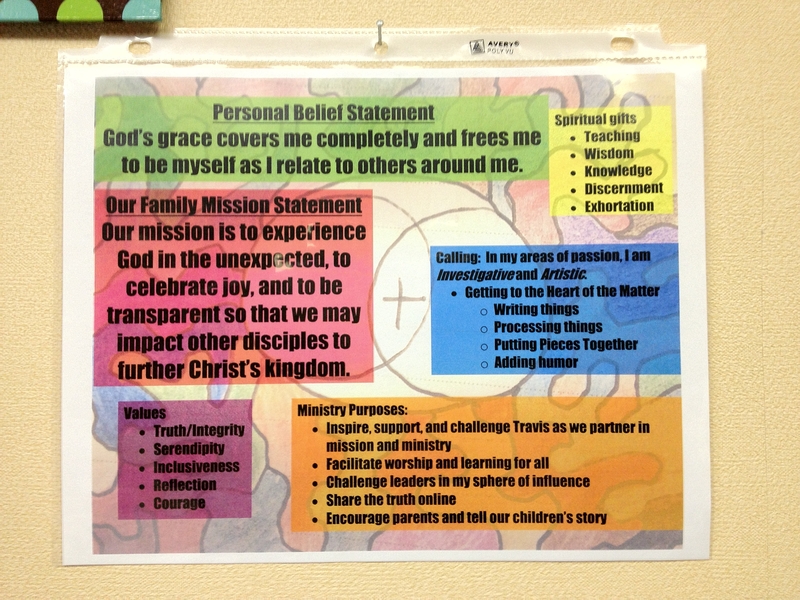 I had also re-done my “ministry map” that we created at PLI. I didn’t like the form they gave us, and besides it was cluttered with my hand-written lists that didn’t look very good at all. I took a doodle I had drawn as the basis for my personal purpose statement and made it the background of my map. Then over the top, I added boxes for each area I wanted to see at a glance. When I got home on Tuesday, I printed it on our color printer, and now it’s hanging above my computer at church. Want to see? Saw an online devotion today that echoes what we frequently discuss, Stephanie. It applies to your retreat and your conclusions, and my thoughts and actions, too.